Annie joined the Clinical Motor Physiology Laboratory in the Fall of 2007, shortly after graduating from Harvard with a B.A. in Neurobiology and a Certificate in Mind, Brain, and Behavior studies. She wrote her undergraduate thesis on fluorescence-based strategies for purifying embryonic stem cell-derived neural cultures, and is generally interested in novel methods towards the early diagnosis and treatment of neurodegenerative disorders. In the CMPL, she assists with patient testing, clinical research projects, and many other tasks. 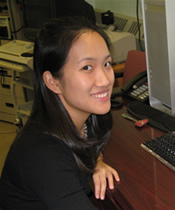 Annie started medical school at the Johns Hopkins School of Medicine in 2010.